Teaching should be a part of our corporate worship, and it still is in most places. However, the quality of the teaching has become suspect with the rise of “seeker-friendly” churches and the “emergent church” position. Considering what passes for the singing part of the service, it is evident that there has been little or no biblical instruction as to what that should look like. Our only teacher seems to be our experiences gleaned from what we have observed others do. In fact, experience is being exalted above knowledge of the Word by some. His statement essentially reads “experience is our authority.” That is the existentialism to which I referred earlier. There has been a strong move in the past few decades to relegate the teaching of the Word of God to a secondary place in our experience of God. It has been subtle, but effective. A biblical understanding of worship—who, what, when, where, and how—is almost non-existent. At least, that would be my guess based on what I observe across the land. In the last article I gave a cursory overview of the history of what we call our worship services. I want to now go into a little history of the musical part of our services. Before the Exodus from Egypt, we have no biblical record of music as a part of worship. That does not mean it was not there; it’s just that we have no record. Music speaks to the heart. It can be used to engender certain emotions. It can be used to “rally the troops.” It can be used to enhance sadness. Regardless of the language spoken, music can be understood by the heart. Music speaks to the heart of God. Judah was one of the 12 sons of Jacob, each of which became one of the tribes of Israel. During the wandering in the wilderness, it was the tribe of Judah that was to lead the people of God. (Num. 2:9) The tribe of praise leads the armies of Israel. For a more in-depth study of the history and progress of worship from the Jews to early Christianity, see Baker’s Evangelical Dictionary or the International Standard Bible Encyclopedia. In more modern times, we had the bugler who would ‘sound the charge’ or the bagpipes leading the marching Scots into battle during WWII. 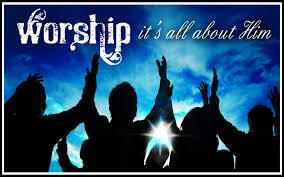 It is praise that usually leads our worship services in today’s church. The praisers (choir) were going first, and going forward. They were not marching backward facing the people as they led them out. As we moved our worship gatherings indoors within the church building, this practice was continued symbolically in the opening processional. This is still done today in some churches. In older church buildings, the choir loft was usually at the back of the church elevated into what we would term a balcony. The choir sang out and above the congregation. As the evangelical movement began to grow and churches became larger with new buildings being built, the choir was moved to the front onto the platform. As a result, the choir now faced the congregation. A new way of leading the congregation in the praise of Almighty God has been ushered in.